Avoid additional charges by adding extra hooks and chain with your pot rack. This pot rack includes Gallery Rails to keep items in place. Available in 24", 36", and 48" varieties, the Cucina Mensola Grande is equipped with double sided stainless hooks to expand storage capabilities (three on the 24" model, four on the 36" model, and five on the 48" model). 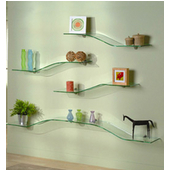 For kitchens with limited wall space, we also offer the same streamlined shelves without pot rack bars and pot hooks. 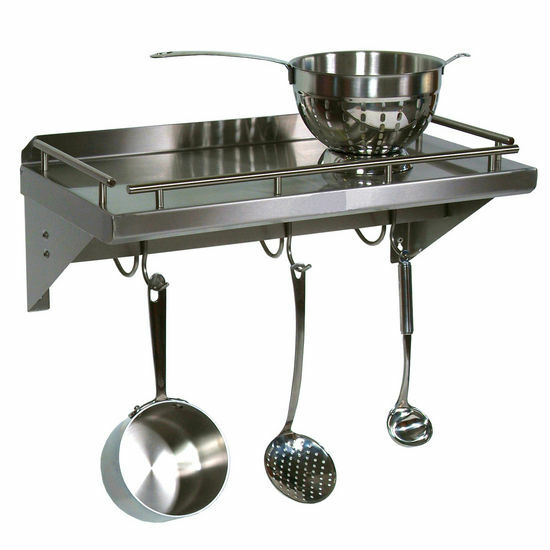 All pot rack models have a depth of 12" and are made with 18 gauge stainless steel. GRWS24-UB: 24" W X12" D x 9 1/2" H, 3 Hooks, 20 lbs. GRWS36-UB: 36" W X12" D x 9 1/2" H, 4 Hooks, 22 lbs. GRWS48-UB: 48" W X12" D x 9 1/2" H, 5 Hooks, 28 lbs. GRWS24: 24" W X12" D x 9 1/2" H, 16 lbs. GRWS36: 36" W X12" D x 9 1/2" H, 22 lbs. GRWS48: 48" W X12" D x 9 1/2" H, 28 lbs. 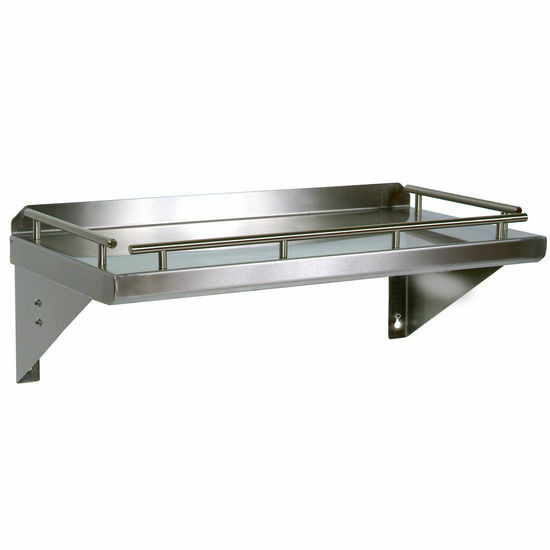 Aero Stainless Steel Deluxe Wall-Mounted Shelf w/ Pot rack, 132" W x 18" D x 12.5" H, 100 lbs. Afina Radiance Rectangular Glass Shelf with Polished Brass Mounting Hardware, 3/8" x 24"
We purchased this kitchen shelf/rack to free up space in our kitchen cupboards. It is a high quality, very functional addition to our kitchen - so glad we chose this product and would reccommend it to anyone wishing to enhance their kitchen. We already have one of these pot racks with the shelf. Buying a second one for my beach house which just finished renovation from Super Store Sandy. This is top notch quality, perfect size for our small home chef kitchen. I put my big stock pots on top and it holds all my pans (I ordered a couple of extra hooks.) Beats digging through a cupboard or drawer to get the right pan out. And made in the USA I love that! Well built, very solid. Very nice addition to my outdoor kitchen. Fast shipping, would recommend product and the company to anyone. 1 love it! even better than I thought! This rack was the finishing touch on our kitchen remodel. It was and is perfect. The shelf holds our biggest All Clad pot and colander. Buy a few extra hooks and it will hold all the pans you use on a day to day basis. Delighted every time I see is as is my wife (happy wife, happy life). Unfortunately this item is not made custom and cannot be made in a 30" Width. Unfortunately this shelf is not available in larger sizes. Per John Boos, if mounted correctly into a stud, it should hold at least 60lbs. Per John Boos, it should hold up to 60lbs if securely mounted to the stud in the wall. The 36" is a true measurement, although we always say to allow for +/- 1/8" for stainless steel products due to the way they are manufactured. John Boos should be able to customize this product for you if you send your quote request into support@kitchensource.com.